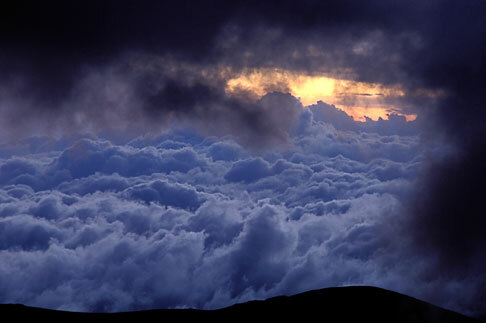 Late in the afternoon at 16,000 feet on Ecaudor’s Chimborazo Volcano, a drifting mist covered the mountain. 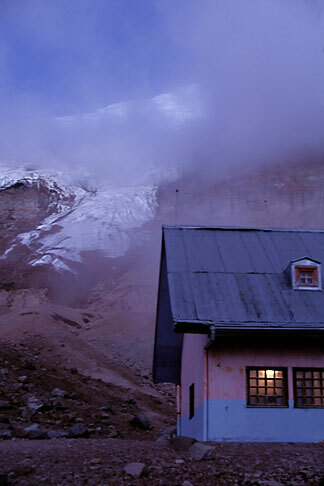 The warm glow of light in the climber’s hut contrasted with the dim distant glacier and I busied myself with various reframings of the composition, vertical horizontal, close, far. Meanwhile my climbing companions explored the rocky talus slopes, preparing for the next day’s climb. Suddenly I heard a shout, “Hey, look a this!” I whirled around 180 degrees to see that the dark clouds had momentarily parted revealing the brilliant orange glow of the setting sun. All the wonder had been happening in the exact opposite direction than where I had been looking. I got one frame and the scene passed.